This article is about the characters. For real-life band, see Red Hot Chili Peppers. The Red Hot Chili Peppers are a rock band. 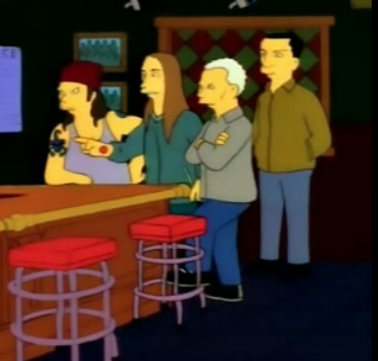 They are first seen in Moe's Tavern after Moe told their agent that place held 30,000 people. They are arguing with Moe and Moe tells them to play as the audience (Barney) is getting restless. They then agree to go on the Krusty Comeback Special if Bart gets them out of the gig at Moe's. Bart tells Moe to look at a wall and the Chili Peppers sneak out. On the show, they sing "Give It Away" in their underwear and Krusty thinks that they are degrading themselves by doing so. They later turn up at Moe's again in only their underwear after the show.